Kanga Loaders are proud to announce that the Kanga Remote Loader TR825 has been awarded Elmore Field Days Australian Machine of the Year. 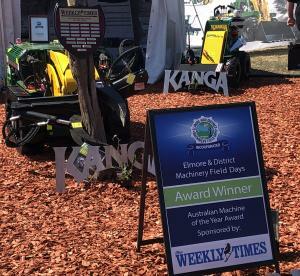 Sponsored by the Weekly Times it was a hotly contested award, with Hodgco Australia’s Bulk-a-more, Leehane Rural Fabrications Portable Cattle Yards, Ozvalue Ag Machinery’s Rolmako U671, and Ruakura’s TS1000 Teat Sprayer were also in the running. Designed to minimise risk and improve productivity the Remote Loader is a prime example of how Kanga has continued to lead the industry in safety, innovation, and performance. Kanga Loaders general manager Rod Lehpamer said the machine’s wireless control extended to 400m, made possible by the integration of cameras to allow operators to monitor their task at hand. “Interest has come from various industry types such as government departments, mines and quarries and there’s been keen interest for tree logging,” Mr Lehpamer said. “We export a lot of these machines into North and South America and have sold over 30 around Australia in the past few years.